Ranked by U.S. News as one of the Best Hotels in Fort Lauderdale for 2019, this re-imagined hotel includes luxurious facilities, such as two outdoor pools lined with lounge chairs and cabanas, seven restaurants and the 14,000-square-foot Diplomat Spa. Located only 10 minutes from FLL and 30 minutes from MIA, this hotel makes it easy for attendees to get to. Note: All rates include complimentary internet in guest rooms. Important Notice: Please be advised that ASTA has not authorized any third party to serve as an official provider of hotel accommodations or to book rooms in ASTA’s room block at the host hotel. If you are solicited by any person or company concerning event accommodations, the contacting party is not authorized to act as ASTA’s advisor. This is the case even if the solicitor uses the ASTA name or logo or otherwise falsely claims affiliation with ASTA, as a number of unscrupulous entities have done in the past. Despite claims to the contrary, these parties do not have access to the discounted room rates we have negotiated with the host hotel, and any booking made through an unauthorized party shall be at the participant’s sole risk and expense. Our partners at American Airlines are offering event attendees 5% off published fares (excluding basic economy and non-discountable fares). Booking instructions can be found on your confirmation email after registering. We have partnered with United Airlines to offer travel discounts of 2% - 10% off fares depending on fare code & type. Visit www.united.com/meetingtravel and enter ZGSX794424 in the Offer Code box. You may also call United Meeting Reservation Desk at 800-426-1122 / Mon-Fri 8am – 10pm ET and Sat/Sun 8am – 6pm ET. Booking fees are waived for Meeting reservations. Valid travel dates must be between 8/15/2019 – 9/3/2019 in order to receive the discount. Please note, for international travel, this includes Star Alliance Partners Air Canada, Lufthansa, Swiss, Brussels, Tyrolean & Austrian Airlines. Driving to ASTA Global Convention or renting a car? 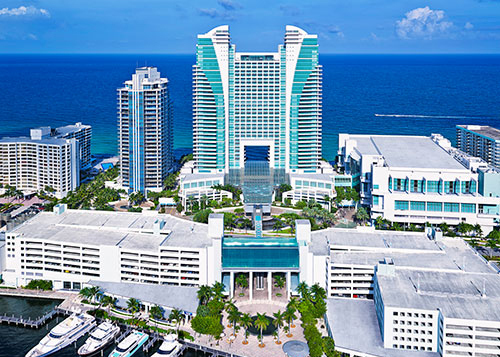 We've partnered with the Diplomat Beach Resort to offer discounted rates for parking during ASTA Global Convention. To redeem: Sign up during registration or visit the Attendee Service Center and add the dates and types of parking to your cart. Onsite instructions for validation will be given at a later time. Terms: Cost is per date and only valid on the dates chosen. No in/out privileges.